Understanding energy density is the key to making a whole food plant-based (WFPB) diet work for you. It is integral to managing your body weight – whether your goal is to lose weight, keep the weight off or conversely, prevent weight loss (which is sometimes a problem for active people on WFPB diets). Energy density is the concentration of calories/kilojoules in food. We tend to use the term “calorie density” because it makes it clear what sort of ‘energy’ we are talking about and because most people are still more familiar with calories than the metric unit, kilojoules (NB There are 4.2 kJ per calorie). Calorie density is the number of calories in a given weight of food. On food labels, it’s the calories per 100g or 100ml, not the calories per serve size. (In the USA they usually refer to calories per pound). While the number of calories in a particular food varies with the portion size, the calorie density stays the same. The chart at the top of this page compares the calorie density of a range of foods. This is not another form of calorie counting so please focus more on the relative heights of the bars rather than the numbers. There is an enormous variation in calorie density, even across healthy plant-based foods. On the far left are foods that have bulk (weight and volume) but very few calories, but as we move across the chart to the right, the foods represented becoming progressively more calorie dense, with vegetable oil being the most concentrated form of calories possible. The chocolate and the apple in this illustration both contain 117 calories but the chocolate has a very high calorie density (535 cal/100g) while the apple has a low calorie density (58cal/100g). 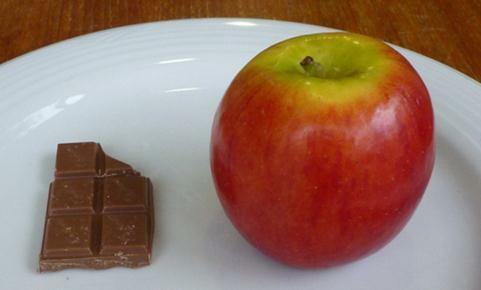 The edible portion of the apple weighs 202g compared to only 21.9g for the piece of chocolate. It would be much easier for someone to eat several of the chocolate portions than several apples. The problem with high calorie density foods is that it’s easy to consume too many calories without feeling as if you have eaten much food. Nuts for example, are one of the most calorie dense foods, and while eating a couple of nuts won’t lead to weight gain, it’s easy to eat a handful and that’s a lot of calories. It’s even easier to eat too many calories worth of nuts when large quantities are used in cooking and sauces. Foods that are low in calorie density (and conversely high in bulk) are those with higher water and fibre content. Removing water increases calorie density – even for healthy foods. Bread has a moderately high calorie density because it has a low water content. It’s easy to eat too many calories of dry foods such as baked goods and dried fruits because they have a high energy density. Processed foods often have a high energy density because processing removes water and fibre, and adds sugar and fat. Fats and oils top the calorie density chart being more than twice the calorie density of sugar. Even the addition of small quantities of oil greatly increases the calorie density of a meal. 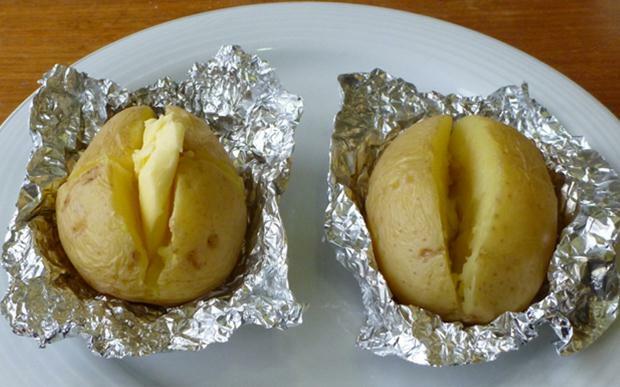 It is interesting to consider the change in calorie content when a small amount of fat or oil is added to a serve of low calorie density whole food; such as garnishing a baked potato with margarine. Intuitively, eating a potato with margarine feels like you are eating mostly potato, but in terms of calories you are actually eating 40% margarine. Just a little butter or a drizzle of olive oil can make a big difference. Adding 10g of margarine to a 137g potato increases the calorie content from 86 calories to 144 calories. Most people eating the potato with margarine would not have registered the extra 58 calories. Note also that the potato with margarine has no additional nutrients; therefore it has a lower nutrient density – less nutrients per calorie of food. (see Nutrient Density). Most foods we eat have ingredients from more than one calorie density group and you could calculate the calorie density of an entire meal or even your average diet but you don’t need to be that mathematically adept. A meal of vegetables and pasta, for example has an energy density in between the vegetable group and the rice/pasta group. The following example shows how the calorie density of a vegetable pasta dish gets progressively lower as more vegetables are added. It’s recommended that you don’t go much lower than half non-starchy vegetables otherwise you’ll just get too hungry and be too tempted to reach for something calorie dense. 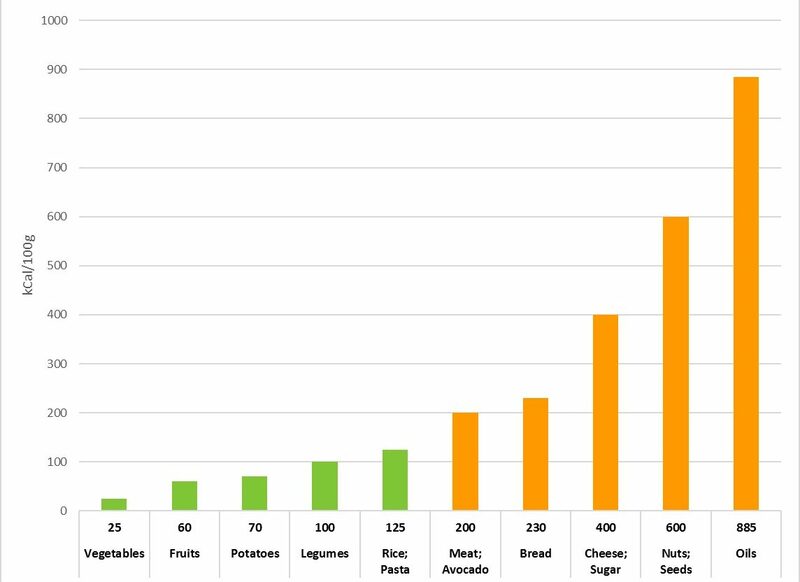 The far left of the energy density chart (non-starchy vegetables) is not where your calories come from and cannot sustain you. People who say they eat mostly (non-starchy) vegetables or salad are getting the bulk of their calories from somewhere else – most often meat (including chicken and fish) and vegetable oil. Dr John McDougall describes his diet as starch-based because it’s the starchy foods that provide the bulk of the calories. We hope you are all getting the idea that for successful weight loss you need to choose more foods from the green zone on the left of the calorie density chart and progressively lesser amounts of foods as we move across to the far right of the red zone. The average calorie density of your usual diet will determine whether you lose weight, maintain weight or gain weight with ad libitum eating. Ad libitum eating means that you eat meals and snacks according to your appetite and until you feel comfortably full. There is no portion control. However, we do not recommend that you spend the whole day grazing from the buffet. Most moderately active people will maintain a steady weight when the average calorie density of their diet is around 125 – in the zone around the rice/pasta group. An energy density of < 90 will result in weight loss, and an energy density of > 180 will result in weight gain. Due to individual variation, some people may need to move up or down within the 90-180 zone to maintain a stable weight. Reducing (or increasing) the calorie density of your diet is simple and only requires a very basic understanding of the position of each group of foods in the calorie density spectrum. Eating more non-starchy vegetables and even fruits will shift your calorie density down. Conversely, a little bit of oil, a moderate amount of nuts and dried fruit or a lot of bread or other baked grains will shift your calorie density upwards. In regard to exercise, higher levels of physical activity may require you to increase your average calorie density to maintain weight, although some athletes just eat ever larger quantities of rice, pasta, beans and potatoes. However please note that unless you can sustain very high levels of physical activities, exercise will not overcome an excessively calorie dense diet. When the energy density gets above about 270 then even endurance athletes gain weight. We have personally witnessed the new phenomenon of the overweight athlete. We hypothesize that they have crossed the 270 line. This would not be difficult for those focussing on getting plenty of animal protein, dairy calcium and olive oil at the expense of whole grains, legumes and vegetables. The best aspect of the low energy density approach to weight management is that it does not require constant hunger and extraordinary will power. You can eat reasonably large portions whenever you are hungry. This sentiment is the common theme in testimonials of those who have tried everything and failed before finding a whole foods plant-based diet. Calorie Density: How to Eat More, Weigh Less and Live Longer – Jeff Novick, RD (1 hr 20 min video) **Full length talk** Excellent explanation of calorie density – essential viewing for anyone eating a whole food plant-based diet, even if you are not trying to lose weight. Pleasure Trap, Part 1 (17 min video) and Pleasure Trap, Part 2 (16 min) – Dr Alan Goldhamer explains why our brain was not designed for our current food environment and in Part 2 covers calorie density. Weight Loss Isn’t Rocket Science (4 min video) – Dr Goldhamer explains why the current advice to eat in moderation and to eat smaller portions does not work! How to lose weight without losing your mind – (1 hr 15 min video) Doug Lisle provides an excellent explanation of why people become overweight and how to reduce weight. It’s all about energy density and our built in reward systems and it takes the personal blame off overweight individuals.